Aephanemer’s history is not exactly sensational. As is the case with many bands it was originally a solo project, in this case of Toulouse, France based metaller Martin Hamiche who translated his preference for Scandinavian melodic death metal into a six-track instrumental EP called Know Thyself. Looking to strengthen the project’s base and fueled by positive critics and, eventually, over 300,000 YouTube hits Martin searched for and found musical peers to transform his one-man-project into a full blown band. Initially these peers were Marion Bascoul as vocalist and rhythm guitarist, Anthony Delmas as bassist and Mickaël Bonnevialle as drummer, while Martin was responsible for the lead guitar. Now at full force Aephanemer unleashed its debut album, Memento Mori, in 2016 which too received positive critics. Just a few months after the release Anthony was been replaced by Lucie Woaye-Hune on bass completing the current line-up. So, two girls and two guys, musical roots in Scandinavian melodic death metal, classical and Slavic influences and to top it off a female vocalist. Not exactly an everyday combination, but definitely an interesting one, one that potentially could stand out in its genre. It certainly got my interest piqued. Bring it on! And exactly that is what they did, delivering their second full-length called Prokopton, presumably named after the term for a follower of the Stoic Philosophy meaning one making progress, which will be released in March. To make absolutely sure they left nothing to chance they hired a couple of big guns to take care of the technical aspect to provide their musical efforts with an appropriate frame: Niklas Sundin for the artwork, Dan Swanö for the mixing and Mika Jussila for mastering. Prokopton opens with the title song that needs a minute or so to fully engulf you in its rhythm, but once fired up you’re doomed. A powerful, heavy yet very accessible, catchy rhythm kicks in, making it almost impossible to stay put, forming a worthy introduction to Marion’s vocals. And damn’, some throat she has, this lady growls like an alpha wolf. Quite an impression she makes here, adding more power to the already energetic song. Apparently Aephanemer’s composer had the same thoughts about Prokopton being a great song, because both succeeding songs, The Sovereign and Dissonance Within have a similar set-up: energetic, illuminating guitar-based melodic death metal fittingly peppered with crushingly angry vocal lines, sound effects and arrangements. Yet, the outro of the latter suggests change is coming, a suggestion that seems to hold true as Snowblind comes crashing down with its black metal-ish start. Aephanemer however, has no plans of straying too far off their path, so soon the now well-known energetic melodic metal takes control of the song as they deliver yet again a powerful song with a rather compelling rhythm. The Slavic influences are most striking in this song when, as an added surprise, Marion gives us a taste of her capability when it comes to clean vocals. This song is my personal favorite and, in case you wondered, Marion’s cleans are more than sufficient. Next, seemingly out of nothing, the album breaks with an instrumental intermezzo that in no way seems to connect to the previous nor the succeeding songs, interrupting its flow. It seems an unnecessary move, but when you consider the lyrical themes and the album title the connection of this rather divergent song, At Eternity’s Gate, to the other songs isn’t too far-fetched after all. Of course I am assuming here, I have no idea if it was the band’s intention or not, but to me it makes perfect sense. Not that it really matters, what it did do was resetting my focus, making the experience of the final part of the album even more intense. I can however see that this will probably not be everyone’s opinion. Anyway, the final part starts with a song that is titled Back Again which happens to be an excellent description of the feeling you get when it blasts from your speakers. Coincidence? I doubt it, but it does not actually matter, it gets you back on track and into the flow. As is the case with Bloodline, a song with a surprising, remarkable intro to say the least. And then, after just 35 minutes it’s time for the final piece, a nine-minute, epic epilogue called If I Should Die. In my opinion an epilogue that is intended to be epic should display every striking feature that characterizes a band’s music. And that is exactly what Aephanemer brings here. Vicious growls, striking drum lines, hauling riffs, humming bass lines that by the way aren’t as prominent as they deserve throughout the album, Aephanemer throws everything they have to offer at you in this song, which is quite substantial I might add. A worthy end of an impressive release I’d say. 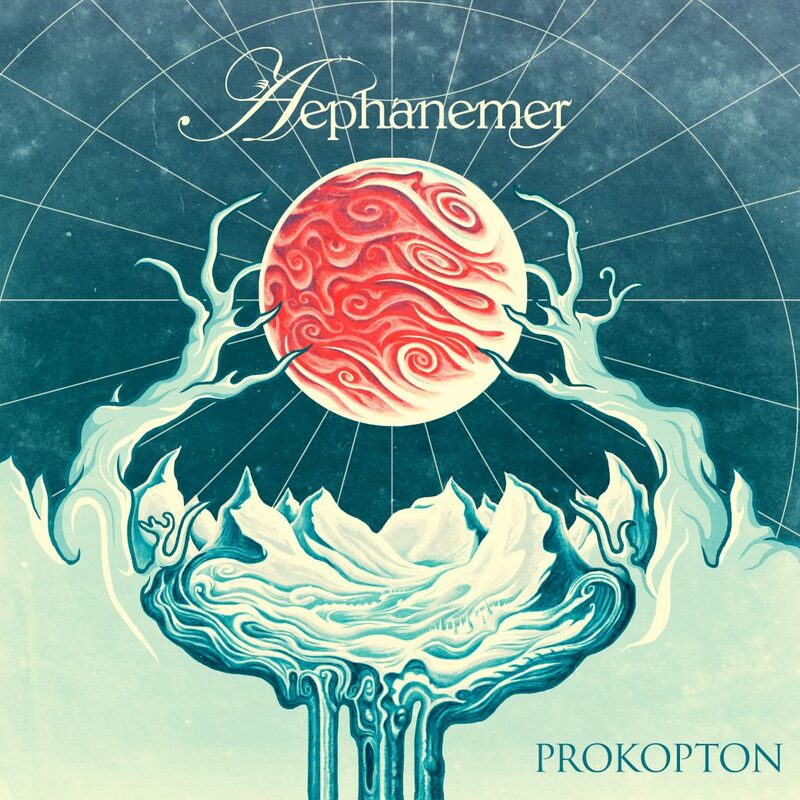 With Prokopton Aephanemer manages to produce an album filled with highly energetic, very accessible melodic death metal that will appeal to many metal fans. The often bone-crushing vocals are a perfect contrast to the rather brightly set death metal, leaving enough power and heaviness without sounding to jolly. Each individual member shows full control over his or her contribution to each song, there is no doubt we’re dealing with skilled, more than capable musicians here. In my opinion this is a superb release, especially considering Aephanemer being a relatively young band. With this in mind it’s safe to assume they have potential to grow and mature even more making them a soon-to-be major player in the modern metal scene. I for one am most certainly going to keep an eye out for this quartet and I’m going to check the two previous releases as well. More than worth my time, this is one of the best and most enjoyable albums I have heard in quite some time. Highly recommended! You’d be selling yourself short if you do not give this a serious listen.